Are you ready to be published? Whether it's a first novel, a family history, a children's book or a photography collection, UBuildABook has the experience and the passion to make it happen! Need full book printing services? At UBuildABook, we view book binding as a meeting of art and science. The latest technology brings us new book binding materials and equipment that goes hand in hand with our careful crafting and experience. At UBuildABook, we see your book binding project as an opportunity to do justice to the work and vision you put into it. Get started now! As a digital printing and publishing specialist, UBuildABook has the versatility and expertise to create your dream book - even if you only need a few. No book binding job is too big or too small at UBuildABook, and we specialize in small runs and first editions. Wondering about the best method for your book binding? Cased hard cover binding is the highest quality binding available. Our 80# printed cover is laminated and glued on heavy board to make a smooth outside cover. The book block is then attached to the inside of the board making a very durable book cover. UBuildABook is unique with its offering of hardcover book binding in-house and in small runs. This is primarily done by hand with special alignment machines and good old attention to detail by book binding artisans. We also have dust jackets available and other cover materials can be used as well. Trust UBuildABook to match the paper grain to your book printing project and the correct process for your book binding project. Why wait? Get published today! Soft Cover Perfect Bound Books are great for training manuals, sports programs, novels and any thick paperback or hardback. Perfect book binding is accomplished with digitally printed pages clamped in a vise-like structure. These pages are drawn across a blade that carves notches in the bound edge. This “roughed up" spine is passed over a hot melt glue dispenser. Glue adheres to the edges and works its way into the notches. After the glue is applied to the spine, the whole assembly is forced into what will become the wrap around cover. Completing the book binding, the cover is folded around the “book block”, glued and folded up the front and back of the book. This form of book binding is preferred as the standard for paperbacks as well as the beginning of a cloth covered high-end hard bound book. We offer two types of Spiral Binding with our soft cover books and two standard coil colors (white or black). Other coil colors are available for an additional cost. We offer plastic coil binding, which is a style that is ideal for books that must lie open flat. The main advantage of plastic coil binding is that the book can be folded in half. This binding is similar to wire binding except it's made of more durable plastic. Choose black or white plastic coil to coordinate with your cover. Coil binding is a colorful and versatile type of book binding chosen for its ability to fold completely over on itself or lay flat for ease of use. This type of book binding is replacing the older metal coil or "wire-o" that has been popular in the past. It can be made to have a very stiff cover and back with a glossy laminated cover or a traditional Acetate clear front cover and blue or black vinyl back that has been in use for decades. UBuildABook has automated equipment for the punching of paper and the insertion of the coils to make your book binding experience quick and trouble free. We offer plastic comb binding (GBC binding) with a soft cover book. Plastic comb binding is also used for books which must lie flat, such as manuals, how-to books, or workbooks. Choose from black or white plastic comb colors to coordinate with your cover. Other colors available for an additional cost. You may also imprint your book title on the plastic comb for an additional $2.00 to $3.00 per book, depending on quantity and size of comb. Saddle stitching is a great book binding option for menus, pamphlets, or short books and magazines. Quick and inexpensive, it is as simple as 2 staples, a fold and a trim. However, it takes an experienced book binding company like UBuildABook to pay attention to details in your digital printing file... like “creep”. “Creep” is the tendency of the middle pages in a saddle stitched book to have their edges protrude from the folded book more and more and more as they approach the center of the bound book. When these pages are trimmed to have a uniform edge, sometimes the middle pages have information trimmed off. UBuildABook manages this with special book binding anti-creep software that gently nudges the print away from the cutting edge as it approaches the middle of the book. 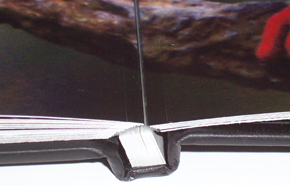 A variation of our standard perfect binding is called Lay Flat binding. Rather than having pages with vanishing hinges that may interrupt a two-page spread, our Lay-Flat paper allows you to create seamless two-page spreads that are both professional and eye-catching. FlexBind ® sheets are compatible with many common bookbinding methods. 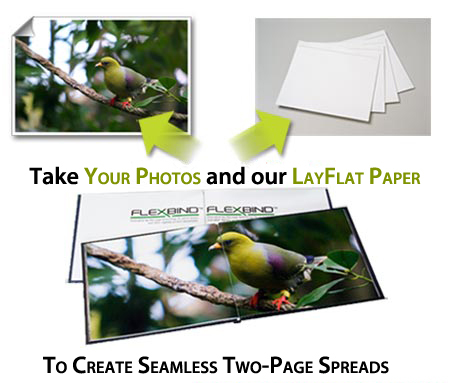 Patent-pending technology allows FlexBind ® sheets to be imaged on many types of digital equipment.